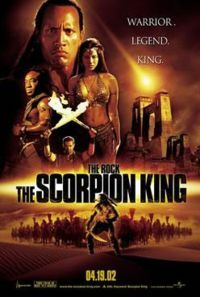 The Scorpion King is a 2002 movie starring Dwayne "The Rock" Johnson, Michael Clarke Duncan, Kelly Hu, Steven Brand, Ralf Moeller, and Grant Heslov, and is directed by Chuck Russell. It is a spin-off prequel to The Mummy series, following the story of Mathayus the Scorpion King, the character who was featured in The Mummy Returns. The events of The Scorpion King take place 5000 years before the events in The Mummy Returns, and shows Mathayus' origins and how he rose to power as the Scorpion King. The name itself is a reference to an indisputably real king during the protodynastic period of Ancient Egyptian history, Serket II. The Scorpion King was the first movie where The Rock played a lead role, following on from his big-screen debut as a peripheral character in The Mummy Returns. The band Godsmack made the song "I Stand Alone" for this movie, which is heard in the credits. Mathayus, an Akkadian mercenary, is assigned to kill Memnon's sorcerer, who gives him tyrannical powers. He sneaks into Memnon's camp and finds his way to the sorcerer's tent. However, his plans change when he discovers that Memnon's sorcerer is actually a beautiful sorceress called Cassandra. He shoots one of the guards and is about to kidnap her, when he is discovered and his brother is killed right in front of him. Just as he is about to be killed, Cassandra protests, saying it wouldn't be wise because the gods favor him and to kill him would bring misfortune. Now free again, Mathayus decides to avenge his brother and kill Memnon. He gets into Sodom and Gomorrah with the help of a thief who earlier on saved him from a bunch of red ants. With the help of the thief and a little boy, Mathayus sneaks into Memnon's castle. He gets into Cassandra's tent and kidnaps her. He discovers he can use her as bait to catch Memnon. During one of Memnon's attempts to kill Mathayus, he is shot by an arrow with scorpion venom, thus the term Scorpion King. Mathayus faints from the pain, but his life is saved by Cassandra, who believes he can save the people and free them from Memnon's tyranny. As their journey continues, they meet up with Balthazar the leader of Memnon's enemies and the two join forces. During a celebration at Balthazer and his people's camp, Cassandra has a vision of Memnon destroying the people and killing Mathayus. After a romantic night with Mathayus, Cassandra returns to Memnon to kill him. Mathayus and Balthazer go after her and a huge battle between Memnon and his armies and Mathayus and Balthazar and his people takes place. At one point in the battle, Mathayus gets shot by another arrow but miraculously recovers, and uses the same arrow to kill Memnon. The battle ends in victory for Balthazar and his people and Mathayus is crowned king with Cassandra by his side.